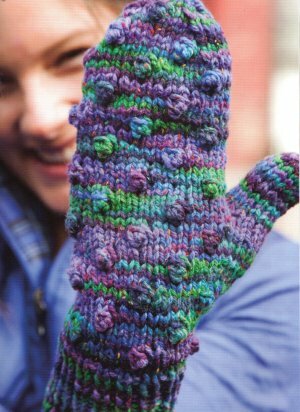 Taken from The Knitter's Guide To Hand-Dyed And Variegated Yarn: "Tiny bobbles are used for these mittens-larger bobbles might be a bit over-whelming-and they are worked on the back of the hand only to keep the mittens practical as well as fun. The bobbles mix up the order of the colors in this yarn." This pattern is in The Knitter's Guide To Hand-Dyed And Variegated Yarn, page 42. Size US 7 DPNs are required but not included. Finished Measurements: 8" circumference x 12" length from cuff to fingertip. Color Shown is Tannhauser in Hand Painted Knitting Yarns Merino Flecks. We substituted and used Malabrigo Worsted Merino in #59 Lime Blue.